The Mandalorian is getting some more company. 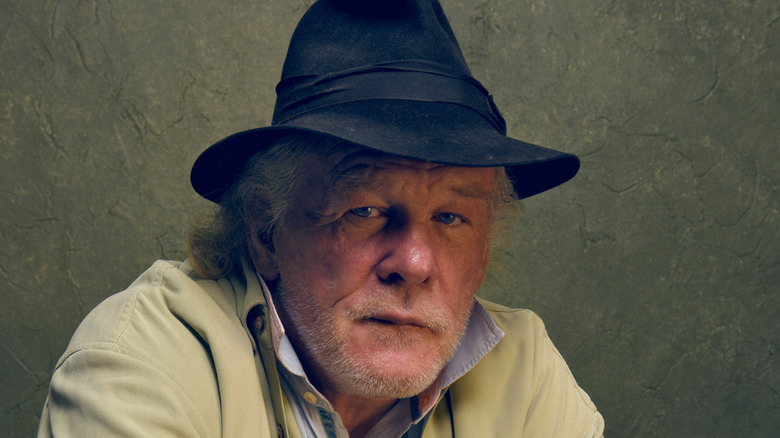 Veteran actor Nick Nolte has been cast in the forthcoming Disney+ streaming series, joining Pedro Pascal in the lead and MMA fighter-turned-actress Gina Carano in an unspecified role. The Hollywood Reporter was the first to break the news. Nolte joins the project as it's already well into production, albeit shrouded in a level of secrecy usually reserved for the launches of new Apple products and the plots of breathlessly awaited Avengers movies. As is the case with Carano, the details of his role are being kept under wraps. The 77 year-old Nolte has had a long and distinguished career in Hollywood. He labored for years taking on bit parts in television series and smaller films before gaining the attention of Tinseltown at large with a breakthrough co-lead role in the 1976 miniseries adaptation of Irwin Shaw's novel Rich Man, Poor Man; this led directly to his first big-screen starring role in the Peter Benchley adaptation The Deep, which propelled him directly onto the A-list. He scored huge box office hits in the '80s opposite Eddie Murphy in 48 Hrs. and Richard Dreyfuss in Down and Out in Beverly Hills, and was nominated for Oscars three times between 1992 and 2012. He was most recently seen in this year's Alzheimer's drama A Head Full of Honey, in which he co-starred with his 11 year-old daughter Sophie. Nolte's veteran presence and natural gravitas can only mean good things for The Mandalorian, which is being shepherded to the small screen by Jon Favreau (director of the first two Iron Man movies) and will feature episodes helmed by Taika Waititi (Thor: Ragnarok), Deborah Chow (Jessica Jones), and Bryce Dallas Howard. His weathered visage and gravelly voice would make him a perfect fit for a character who has been to every imaginable corner of the galaxy, and his formidable range makes him more than capable of portraying a trusted ally, a dangerous adversary — or, dare we say, a little of both. While we don't know much about The Mandalorian, we do know that it will sport an exceedingly unique visual flair, thanks to comments made by Avengers: Infinity War co-director Joe Russo after a recent visit to the set. According to Collider, Russo — who dropped by to "say hi to Jon" and Waititi — gushed over the fact that the series is shaping up to look like nothing else on TV. "Jon is always at the forefront of cutting edge tech, and he is shooting this in a way that no one has ever shot anything ever before," Russo said. "It's pretty astounding." That certainly sounds exciting, and while it may not be much, it's more than we've gotten out of anyone even tangentially involved with the project so far. Disney's official logline is similarly vague: "After the stories of Jango and Boba Fett, another warrior emerges in the Star Wars universe. The Mandalorian is set after the fall of the Empire and before the emergence of the First Order. We follow the travails of a lone gunfighter in the outer reaches of the galaxy far from the authority of the New Republic." Well, there is one other thing that's clear: Disney is going big with its casting. The news on this front appears to be accelerating, so we can probably expect more developments soon, and we'll be here to report them as they happen. The Mandalorian is expected to debut on Disney+ sometime next year.